Pulmonary artery banding (PAB) is a technique of palliative surgical therapy used by congenital heart surgeons as a staged approach for operative correction of congenital heart defects. This technique was widely used in the past as an initial surgical intervention for infants born with cardiac defects characterized by left-to-right shunting and pulmonary overcirculation. Within the last two decades, early definitive intracardiac repair has largely replaced palliation with PAB. This trend has evolved because many centers have demonstrated improved outcomes with primary corrective surgery as an initial intervention in the neonate with congenital heart disease. Although the use of PAB has recently significantly decreased, it continues to maintain a therapeutic role in certain subsets of patients with congenital heart disease. The primary objective of performing PAB is to reduce excessive pulmonary blood flow and protect the pulmonary vasculature from hypertrophy and irreversible (fixed) pulmonary hypertension. More recently, PAB has played a role in the preparation and "training" of the left ventricle (LV) in patients with D-transposition of the great arteries (d-TGA) who are evaluated for a delayed arterial switch procedure. It has found a similar role in training the LV in patients with L-transposition of the great arteries (L-TGA) who may also be candidates for an arterial switch procedure. Safe placement of a pulmonary artery band: (A) encircling the aortopulmonary trunk, (B) encircling the aorta, and (C) completing the pulmonary artery band at the final location. Although the use of PAB has declined, it remains an essential technique for comprehensive surgical treatment in patients with congenital heart disease. PAB is a palliative but not a curative surgical procedure. Congenital heart defects with left-to-right shunting and unrestricted pulmonary blood flow (PBF) due to a drop in pulmonary vascular resistance result in pulmonary overcirculation. In the acute setting, this leads to pulmonary edema and congestive heart failure (CHF) in the neonate. Within the first year of life, this unrestricted flow and pressure can lead to medial hypertrophy of the pulmonary arterioles and fixed pulmonary hypertension. Pulmonary artery banding (PAB) creates a narrowing, or stenosing, of the main pulmonary artery (MPA) that decreases blood flow to the branch pulmonary arteries and reduces PBF and pulmonary artery pressure. In patients with cardiac defects that produce left-to-right shunting, this restriction of PBF reduces the shunt volume and consequently improves both systemic pressure and cardiac output. A reduction of PBF also decreases the total blood volume returning to the LV (or the systemic ventricle) and often improves ventricular function. PAB may not be tolerated in patients who have cardiac defects that depend on mixing of the systemic and pulmonary venous blood to maintain adequate systemic oxygen saturations. This is particularly true if a restrictive communication is present between the 2 atria. Therefore, ensuring that such patients have an unrestricted atrial communication is important to allow adequate mixing at the atrial level before proceeding with PAB. This can be accomplished with a balloon atrial septostomy or an operative atrial septectomy at the time of PAB. Patients who are selected for pulmonary artery banding (PAB) and staged cardiac repair are determined based on the experience and training of the pediatric cardiologists and congenital heart surgeons at any given institution. Most of these patients fall into 2 broad categories: (1) those with pulmonary overcirculation and left-to-right shunting who require reduction of pulmonary blood flow (PBF) as a staged approach to more definitive repair and (2) those with transposition of the great arteries (TGA) who require training of the left ventricle (LV) as a staged approach to the arterial switch procedure. Cardiac defects that require a homograft conduit (eg, D-TGA with subpulmonic stenosis requiring a Rastelli-type repair) for complete repair: Use of PAB may allow time for growth of the patient before the complete repair. Interim growth of the patient permits placement of a larger conduit at the time of repair and potentially increases the longevity of the conduit and length of freedom from reoperation. With current clinical practice, most patients with D-TGA pulmonary stenosis (PS) undergo a Rastelli procedure and placement of a right ventricle (RV)–to–pulmonary artery (PA) conduit. If a staged repair is indicated, a PAB is not usually performed because of already decreased PBF. In this situation, a systemic-to-pulmonary shunt is performed. Patients with dextr-transposition of the great arteries (D-TGA) with subpulmonic stenosis usually have decreased PBF. The patient who would require PAB in this situation to allow for somatic growth so as to allow a larger conduit to be placed would be rare. D-TGA that requires preparation of LV for an arterial switch procedure following initial late presentation or diagnosis in patients older than 1 month or older than about 6-8 weeks of age with signs of LV deconditioning. Note that patients with single ventricle physiology and unrestricted PBF are suitable for an early PAB to prevent development of congestive heart failure (CHF) and pulmonary hypertension. This group of patients may include those who have tricuspid atresia with unrestrictive VSD, unbalanced AVC defect, and double inlet LV. In one reported series, 9 of 20 patients with double inlet LV demonstrated severe PA medial hypertrophy on histologic examination within one year of life. Generally, patients who have single ventricle physiology and pulmonary overcirculation should undergo PAB in the first 1-2 months of life to avoid irreversible pulmonary hypertension that may complicate or preclude a subsequent Fontan procedure. Currently, most patients with D-TGA undergo an arterial switch procedure within the first few weeks of life. However, some newborns with D-TGA and an intact ventricular septum may not undergo an early arterial switch procedure because of active infections, coexistent noncardiac diseases, or a delay in diagnosis. Because of the risks of neonatal repair, neonates with D-TGA and multiple VSDs may benefit from bilateral PAB prior to definitive repair later in infancy. This technique may be less prone to damaging the neoaortic valve and root dilation than banding of the main pulmonary artery. Patients with Taussig-Bing syndrome who are premature and have low birth weight, as well as have associated anomalies including arch obstruction, chromosomal and major extracardiac anomalies, pneumonia, shock, hepatic and/or renal failure may also benefit from PAB prior to complete repair. The arch repair and PAB may be done initially, followed by arterial switch and VSD repair in 2-4 weeks. PAB is also used in patients with D-TGA who develop right ventricular dysfunction after a Mustard or Senning atrial switch procedure. The PAB is required for a longer period than preparation of the ventricle in infants (<12 months). Although the overall early survival rate approaches 90%, approximately one half of these patients require heart transplantation because of the progression of coexisting left ventricular failure. Furthermore, a high prevalence of significant neo-aortic valve insufficiency is noted in patients who successfully undergo the arterial switch procedure. Recent application of PAB has been reported in patients with diagnosis of L-transposition or physiologically corrected transposition of the great arteries. This group of patients may present with failing systemic RV. Using the same principle, the PAB is used to retrain the LV in preparation for a double switch operation, a combination of an atrial and arterial switch. [23, 24, 25, 26] This operation places the LV as the systemic ventricle and the mitral valve as the systemic AV valve. This achieves anatomic repair of the malformation. In most patients with cardiac defects requiring pulmonary artery banding (PAB), the length of main pulmonary artery (MPA) is sufficient to allow placement of the band in the mid portion of the artery without impingement on either the pulmonary valve, coronary arteries proximally or the branch pulmonary arteries distally. The inferior wall of the right pulmonary artery (PA) arises slightly more proximal on the MPA than the left PA. The right PA also arises from the MPA at more of an acute angle. Both of these factors increase risk of right PA impingement by a distally placed band. The tissue connecting the aorta and MPA in the aortopulmonary window usually must be divided with surgical dissection. In patients with pulmonary overcirculation, the MPA may be quite large compared to the aorta. Additionally, the MPA vessel wall may be thinned out by this dilatation, and the adventitia may be quite attenuated. These changes increase risk of tearing the wall of the MPA at the time of PAB. Patients who have single ventricle defects in which the aorta arises from an outflow chamber (eg, double inlet left ventricle [LV], tricuspid atresia with transposition of the great arteries [TGA]) have the potential for development of significant subaortic obstruction. The risk is higher when these lesions are also associated with aortic arch anomalies. Pulmonary artery banding (PAB) is contraindicated in the presence of such obstruction and in patients who are at high risk for such obstruction. The ventricular hypertrophy that develops in response to PAB may cause rapid progression of subaortic obstruction leading to a combination of both ventricles having outflow tract obstruction and progressive hypertrophy. Instead, these patients should undergo the Damus-Kaye-Stansel procedure and a systemic-to-pulmonary artery shunt. [30, 31] This achieves adequate pulmonary blood flow (PBF) with protection of the pulmonary vasculature and bypasses the subaortic obstruction. Another well-described complication of PAB is the development of subaortic obstruction from conal hypertrophy, particularly in patients with a single ventricle and a subaortic outflow chamber. It may also result from hypertrophy of an abnormally positioned moderator band. PAB is not used in patients diagnosed with truncus arteriosus. Although a main pulmonary artery (MPA) is present in truncus arteriosus type I, it usually is very short and does not allow for successful PAB without impingement on the right pulmonary artery (PA) or the origin of the MPA from the truncal artery. In truncus arteriosus types II and III, bilateral PAB is necessary to effectively reduce PBF. Previous experience has shown that balancing PBF to the right and left lungs is extremely difficult. Furthermore, subsequent complete repair is complicated by bilateral PA stenosis requiring extensive reconstruction. For these reasons, PAB is avoided in this group of patients. Note that early attempts to use PAB in surgical management of HLHS were also unsuccessful. However, more recent reports have shown that, in high-risk patients with HLHS, a hybrid approach of stenting the ductus arteriosus and bilateral PAB may achieve effective short-term palliation. [40, 41, 42, 43] As with the early attempts at PAB in patients with truncus arteriosus, balancing the systemic and pulmonary blood flow and achieving near-equal distribution of blood flow to the right and left lungs can be extremely difficult in these patients. This is a technically delicate and demanding maneuver that, until more data are available, should only be considered in high-risk patients. Muller WH, Dammann JF. Treatment of certain congenital malformations of the heart by the creation of pulmonic stenosis to reduce pulmonary hypertension and excessive pulmonary blood flow: A preliminary report. Surgery Gynecol Obstet. 1952. 95:213. Idriss FS, Riker WL, Paul MH. 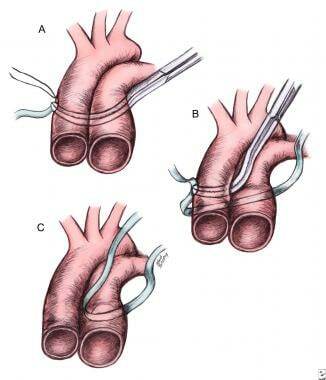 Banding of the pulmonary artery: a palliative surgical procedure. J Pediatr Surg. 1968 Aug. 3(4):465-74. [Medline]. Stark J, Aberdeen E, Waterston DJ, et al. Pulmonary artery constriction (banding): a report of 146 cases. Surgery. 1969 May. 65(5):808-18. [Medline]. Hunt CE, Formanek G, Levine MA, et al. Banding of the pulmonary artery. Results in 111 children. Circulation. 1971 Mar. 43(3):395-406. [Medline]. Thomson NB Jr, Niguidula FN, Hohn A. Correction of complete atrioventricular canal defect in patients with previous pulmonary artery banding. Am J Cardiol. 1966 Nov. 18(5):769-76. [Medline]. Somerville J, Agnew T, Stark J, et al. Banding of the pulmonary artery for common atrioventricular canal. Br Heart J. 1967 Nov. 29(6):816-28. [Medline]. Epstein ML, Moller JH, Amplatz K, Nicoloff DM. Pulmonary artery banding in infants with complete atrioventricular canal. J Thorac Cardiovasc Surg. 1979 Jul. 78(1):28-31. [Medline]. Tingelstad JB, Lower RR, Howell TR, Eldredge WJ. Pulmonary artery banding in tricuspid atresia without transposed great arteries. Am J Dis Child. 1971 May. 121(5):434-7. [Medline]. McNicholas K, de Leval M, Stark J, et al. Surgical treatment of ventricular septal defect in infancy. Primary repair versus banding of pulmonary artery and later repair. Br Heart J. 1979 Feb. 41(2):133-8. [Medline]. Oldham HN Jr, Kakos GS, Jarmakani MM, Sabiston DC Jr. Pulmonary artery banding in infants with complex congenital heart defects. Ann Thorac Surg. 1972 Apr. 13(4):342-50. [Medline]. Silverman N, Levitsky S, Fisher E, et al. Efficacy of pulmonary artery banding in infants with complete atrioventricular canal. Circulation. 1983 Sep. 68(3 Pt 2):II148-53. [Medline]. Alsoufi B, McCracken C, Shashidharan S, Kogon B, Border W, Kanter K. Palliation outcomes of neonates born with single-ventricle anomalies associated With aortic arch obstruction. Ann Thorac Surg. 2016 Sep 1. [Medline]. Sasaki T, Takahashi Y, Ando M, Wada N, Kawase Y, Seki H. Bilateral pulmonary artery banding for hypoplastic left heart syndrome and related anomalies. Gen Thorac Cardiovasc Surg. 2008 Apr. 56(4):158-62. [Medline]. Cools B, Brown SC, Louw J, Heying R, Meyns B, Gewillig M. Pulmonary artery banding as 'open end' palliation of systemic right ventricles: an interim analysis. Eur J Cardiothorac Surg. 2012 Apr. 41 (4):913-8. [Medline]. Ma K, Gao H, Hua Z, et al. Palliative pulmonary artery banding versus anatomic correction for congenitally corrected transposition of the great arteries with regressed morphologic left ventricle: long-term results from a single center. J Thorac Cardiovasc Surg. 2014 Oct. 148 (4):1566-71. [Medline]. Moodie DS, Ritter DG, Tajik AH, et al. Long-term follow-up after palliative operation for univentricular heart. Am J Cardiol. 1984 Jun 1. 53(11):1648-51. [Medline]. Juaneda E, Haworth SG. Double inlet ventricle. Lung biopsy findings and implications for management. Br Heart J. 1985 May. 53(5):515-9. [Medline]. Weinstein S, Liveris A, Shenoy RU, Lacour-Gayet F. Bilateral pulmonary arterial banding for complex transposition of the great arteries. J Thorac Cardiovasc Surg. 2013 Mar. 145 (3):876-8. [Medline]. Sievers HH, Lange PE, Arensman FW, et al. Influence of two-stage anatomic correction on size and distensibility of the anatomic pulmonary/functional aortic root in patients with simple transposition of the great arteries. Circulation. 1984 Aug. 70(2):202-8. [Medline]. Yacoub MH, Radley-Smith R, Maclaurin R. Two-stage operation for anatomical correction of transposition of the great arteries with intact interventricular septum. Lancet. 1977 Jun 18. 1(8025):1275-8. [Medline]. Chang AC, Wernovsky G, Wessel DL, et al. Surgical management of late right ventricular failure after Mustard or Senning repair. Circulation. 1992 Nov. 86(5 Suppl):II140-9. [Medline]. Winlaw DS, McGuirk SP, Balmer C. Intention-to-treat analysis of pulmonary artery banding in conditions with a morphological right ventricle in the systemic circulation with a view to anatomic biventricular repair. Circulation. 2005 Feb 1. 111(4):405-11. [Medline]. [Full Text]. Duncan BW, Mee RB, Mesia CI, et al. Results of the double switch operation for congenitally corrected transposition of the great arteries. Eur J Cardiothorac Surg. 2003 Jul. 24(1):11-9; discussion 19-20. [Medline]. Duncan BW, Mee RB, Mesia CI. Results of the double switch operation for congenitally corrected transposition of the great arteries. Eur J Cardiovasc Surg. 2003. 24(1):11-19. [Medline]. Ly M, Belli E, Leobon B, et al. Results of the double switch operation for congenitally corrected transposition of the great arteries. Eur J Cardiothorac Surg. 2009 Apr 3. [Medline]. Quinn DW, McGuirk SP, Metha C, et al. The morphologic left ventricle that requires training by means of pulmonary artery banding before the double-switch procedure for congenitally corrected transposition of the great arteries is at risk of late dysfunction. J Thorac Cardiovasc Surg. 2008 May. 135(5):1137-44, 1144.e1-2. [Medline]. Khan SA, Gelb BD, Nguyen KH. Evaluation of pulmonary artery banding in the setting of ventricular septal defects and severely elevated pulmonary vascular resistance. Congenit Heart Dis. 2006 Sep. 1 (5):244-50. [Medline]. Franklin RC, Sullivan ID, Anderson RH, et al. Is banding of the pulmonary trunk obsolete for infants with tricuspid atresia and double inlet ventricle with a discordant ventriculoarterial connection? Role of aortic arch obstruction and subaortic stenosis. J Am Coll Cardiol. 1990 Nov. 16(6):1455-64. [Medline]. Matitiau A, Geva T, Colan SD, et al. Bulboventricular foramen size in infants with double-inlet left ventricle or tricuspid atresia with transposed great arteries: influence on initial palliative operation and rate of growth. J Am Coll Cardiol. 1992 Jan. 19 (1):142-8. [Medline]. Huddleston CB, Canter CE, Spray TL. Damus-Kaye-Stansel with cavopulmonary connection for single ventricle and subaortic obstruction. Ann Thorac Surg. 1993 Feb. 55(2):339-45; discussion 346. [Medline]. Rodefeld MD, Ruzmetov M, Schamberger MS, et al. Staged surgical repair of functional single ventricle in infants with unobstructed pulmonary blood flow. Eur J Cardiothorac Surg. 2005. 27(6):949-55. [Medline]. Freedom RM, Sondheimer H, Sische R, Rowe RD. Development of "subaortic stenosis" after pulmonary arterial banding for common ventricle. Am J Cardiol. 1977 Jan. 39(1):78-83. [Medline]. Caspi J, Coles JG, Rabinovich M, et al. Morphological findings contributing to a failed Fontan procedure. Twelve-year experience. Circulation. 1990 Nov. 82(5 Suppl):IV177-82. [Medline]. Malcic I, Sauer U, Stern H, et al. The influence of pulmonary artery banding on outcome after the Fontan operation. J Thorac Cardiovasc Surg. 1992 Sep. 104(3):743-7. [Medline]. Stein DG, Laks H, Drinkwater DC, et al. Results of total cavopulmonary connection in the treatment of patients with a functional single ventricle. J Thorac Cardiovasc Surg. 1991 Aug. 102(2):280-6; discussion 286-7. [Medline]. Tomoyasu T, Miyaji K, Miyamoto T, Inoue N. The bilateral pulmonary artery banding for hypoplastic left heart syndrome with a diminutive ascending aorta. Interact Cardiovasc Thorac Surg. 2009 Apr. 8(4):479-81. [Medline]. Galantowicz M, Cheatham JP, Phillips A, et al. Hybrid approach for hypoplastic left heart syndrome: intermediate results after the learning curve. Ann Thorac Surg. 2008 Jun. 85 (6):2063-70; discussion 2070-1. [Medline]. Brown S, Boshoff D, Rega F, Eyskens B, Meyns B, Gewillig M. Dilatable pulmonary artery banding in infants with low birth weight or complex congenital heart disease allows avoidance or postponement of subsequent surgery. Eur J Cardiothorac Surg. 2010 Feb. 37 (2):296-301. [Medline]. Gibbs JL, Wren C, Watterson KG, et al. Stenting of the arterial duct combined with banding of the pulmonary arteries and atrial septectomy or septostomy: a new approach to palliation for the hypoplastic left heart syndrome. Br Heart J. 1993 Jun. 69(6):551-5. [Medline]. Lim DS, Peeler BB, Matherne GP, et al. Risk-stratified approach to hybrid transcatheter-surgical palliation of hypoplastic left heart syndrome. Pediatr Cardiol. 2006. 27(1):91-95. [Medline]. Pizarro C, Norwood WI. Pulmonary artery banding before Norwood procedure. Ann Thorac Surg. 2003 Mar. 75(3):1008-10. [Medline]. Ishizaka T, Ohye RG, Suzuki T, et al. Bilateral pulmonary artery banding for resuscitation in hypoplastic left heart syndrome. Ann Thorac Surg. 2003 Jan. 75(1):277-9. [Medline]. Michel-Behnke I, Akintuerk H, Marquardt I, et al. Stenting of the ductus arteriosus and banding of the pulmonary arteries: basis for various surgical strategies in newborns with multiple left heart obstructive lesions. Heart. 2003 Jun. 89(6):645-50. [Medline]. [Full Text]. Yerebakan C, Valeske K, Elmontaser H, et al. Hybrid therapy for hypoplastic left heart syndrome: Myth, alternative, or standard?. J Thorac Cardiovasc Surg. 2016 Apr. 151 (4):1112-21, 1123.e1-5. [Medline]. Assad R, Devine C. Adjustable pulmonary artery banding system. Rev Bras Cir Cardiovasc. 2008 Dec. 23(4):591. [Medline]. Davis MC. Use of a new implantable adjustable pulmonary artery banding device: a report of two patients. J Extra Corpor Technol. 2008 Mar. 40(1):65-7. [Medline]. Trusler GA, Mustard WT. A method of banding the pulmonary artery for large isolated ventricular septal defect with and without transposition of the great arteries. Ann Thorac Surg. 1972 Apr. 13(4):351-5. [Medline]. Albus RA, Trusler GA, Izukawa T, Williams WG. Pulmonary artery banding. J Thorac Cardiovasc Surg. 1984 Nov. 88(5 Pt 1):645-53. [Medline]. Laks H, Odim JN, Sadeghi AM, Allada V. The incisional pulmonary artery band. Ann Thorac Surg. 1999 Jun. 67(6):1813-4. [Medline]. Kotani Y, Coles M, Desai ND, et al. The utility of aortic blood flow measurements in the prediction of pulmonary artery banding outcome. Ann Thorac Surg. 2015 Jun. 99 (6):2096-100. [Medline]. Holmström H, Bjørnstad PG, Smevik B, Lindberg H. Balloon dilatation of pulmonary artery banding: Norwegian experience over more than 20 years. Oct 9, 2009. [Medline]. Simpson IA, Valdes-Cruz LM, Berthoty DP, et al. Cine magnetic resonance imaging and color Doppler flow mapping in infants and children with pulmonary artery bands. Am J Cardiol. 1993 Jun 15. 71(16):1419-26. [Medline]. Yasui H, Kado H, Yonenaga K, et al. Arterial switch operation for transposition of the great arteries, with special reference to left ventricular function. J Thorac Cardiovasc Surg. 1989 Oct. 98(4):601-10. [Medline]. Wernovsky G, Giglia TM, Jonas RA, et al. Course in the intensive care unit after ''preparatory'' pulmonary artery banding and aortopulmonary shunt placement for transposition of the great arteries with low left ventricular pressure. Circulation. 1992 Nov. 86(5 Suppl):II133-9. [Medline]. Davies RR, Radtke WA, Klenk D, Pizarro C. Bilateral pulmonary arterial banding results in an increased need for subsequent pulmonary artery interventions. J Thorac Cardiovasc Surg. 2014 Feb. 147(2):706-12. [Medline]. Robertson MA, Penkoske PA, Duncan NF. Right pulmonary artery obstruction after pulmonary artery banding. Ann Thorac Surg. 1991 Jan. 51(1):73-5. [Medline]. Fletcher BD, Garcia EJ, Colenda C, Borkat G. Reduced lung volume associated with acquired pulmonary artery obstruction in children. AJR Am J Roentgenol. 1979 Jul. 133(1):47-52. [Medline]. Steussy HF, Caldwell RL, Wills ER, Waller BF. High takeoff of the left main coronary artery from the pulmonary trunk: potentially fatal combination with pulmonary trunk banding. Am Heart J. 1984 Sep. 108(3 Pt 1):619-21. [Medline]. Daskalopoulos DA, Edwards WD, Driscoll DJ, et al. Fatal pulmonary artery banding in truncus arteriosus with anomalous origin of circumflex coronary artery from right pulmonary artery. Am J Cardiol. 1983 Dec 1. 52(10):1363-4. [Medline]. Warnecke I, Bein G, Bucherl ES. The relevance of intraoperative pressure and oxygen saturation monitoring during pulmonary artery banding in infancy. J Cardiothorac Anesth. 1989 Feb. 3(1):31-6. [Medline]. Kutsche LM, Alexander JA, Van Mierop LH. Hemolytic anemia secondary to erosion of a Silastic band into the lumen of the pulmonary trunk. Am J Cardiol. 1985 May 1. 55(11):1438-9. [Medline]. Garcia EJ, Riggs T, Hirschfeld S, Liebman J. Echocardiographic assessment of the adequacy of pulmonary arterial banding. Am J Cardiol. 1979 Sep. 44(3):487-92. [Medline]. Danilowicz D, Presti S, Colvin S. The disappearing pulmonary artery band. Pediatr Cardiol. 1990 Jan. 11(1):47-9. [Medline]. Horowitz MD, Culpepper WS 3rd, Williams LC 3rd, et al. Pulmonary artery banding: analysis of a 25-year experience. Ann Thorac Surg. 1989 Sep. 48(3):444-50. [Medline]. Mahle S, Nicoloff DM, Knight L, Moller JH. Pulmonary artery banding: long-term results in 63 patients. Ann Thorac Surg. 1979 Mar. 27(3):216-24. [Medline]. Kron IL, Nolan SP, Flanagan TL, et al. Pulmonary artery banding revisited. Ann Surg. 1989 May. 209(5):642-7; discussion 647. [Medline]. Dajee H, Benson L, Laks H. An improved method of pulmonary artery banding. Ann Thorac Surg. 1984 Mar. 37(3):254-7. [Medline]. Takayama H, Sekiguchi A, Chikada M, et al. Mortality of pulmonary artery banding in the current era: recent mortality of PA banding. Ann Thorac Surg. 2002 Oct. 74(4):1219-23; discussion 1223-4. [Medline]. O'Brien SM, Clarke DR, Jacobs JP, et al. An empirically based tool for analyzing mortality associated with congenital heart surgery. J Thorac Cardiovasc Surg. 2009 Nov. 138 (5):1139-53. [Medline]. Piluiko VV, Poynter JA, Nemeh H, et al. Efficacy of intraluminal pulmonary artery banding. J Thorac Cardiovasc Surg. 2005. 129(3):544-50. [Medline]. Le Bret E, Bonhoeffer P, Folliguet TA, et al. A new percutaneously adjustable, thoracoscopically implantable, pulmonary artery banding: an experimental study. Ann Thorac Surg. 2001. 72(4):1358-61. [Medline]. Leeuwenburgh BP, Schoof PH, Steendijk P, et al. Chronic and adjustable pulmonary artery banding. J Thorac Cardiovasc Surg. 2003. 125(2):231-7. [Medline]. Bonnet D, Corno AF, Sidi D, et al. Early clinical results of the telemetric adjustable pulmonary artery banding FloWatch-PAB. Circulation. 2004 Sep 14. 110(11 Suppl 1):II158-63. [Medline]. [Full Text]. Corno AF, Bonnet D, Sekarski N, et al. Remote control of pulmonary blood flow: initial clinical experience. J Thorac Cardiovasc Surg. 2003. 126(6):1775-80. [Medline]. Dibardino DJ, Kleeman K, Bove EL. A method of transcutaneously adjustable pulmonary artery banding for staged left ventricular retraining. J Thorac Cardiovasc Surg. 2012 Sep. 144 (3):553-6. [Medline]. Talwar S, Kamat NA, Choudhary SK, et al. Mid-term outcomes of patients undergoing adjustable pulmonary artery banding. Indian Heart J. 2016 Jan-Feb. 68 (1):72-6. [Medline]. Brooks A, Geldenhuys A, Zuhlke L, Human P, Zilla P. Pulmonary artery banding: still a valuable option in developing countries?. Eur J Cardiothorac Surg. 2012 Feb. 41(2):272-6. [Medline]. Schranz D, Rupp S, Muller M, et al. Pulmonary artery banding in infants and young children with left ventricular dilated cardiomyopathy: a novel therapeutic strategy before heart transplantation. J Heart Lung Transplant. 2013 May. 32 (5):475-81. [Medline]. Valente AS, Mesquita F, Mejia JA, et al. Pulmonary artery banding: a simple procedure? A critical analysis at a tertiary center. Rev Bras Cir Cardiovasc. 2009 Jul-Sep. 24(3):327-33. [Medline]. Murugesan C, Banakal SK, Garg R, Keshavamurthy S, Muralidhar K. The efficacy of aprotinin in arterial switch operations in infants. Anesth Analg. 2008 Sep. 107(3):783-7. [Medline]. The left anterior thoracotomy approach through the second or third intercostal space gives excellent exposure for isolated pulmonary artery banding. Note anatomy of the adjacent structures with medial limits of the incision at the internal mammary vessels. The thymus is swept superiorly away from the phrenic nerve. PA = pulmonary artery; PDA = patent ductus arteriosus. Pulmonary artery banding technique (A-C) using a premeasured Trusler formula adjusted to the cardiac anatomy and physiology. An adjustable device is placed over a felt pledget with adventitial fixation sutures to prevent distal migration. Additional fixation sutures may be placed in the band itself. Each additional medium hemoclip causes approximately 1 mm of change in band circumference. Distal pulmonary artery pressure is measured during tightening. Circumferential banding of a dilated pulmonary artery can acutely lead to internal infolding of the arterial wall. Later resorption of the infoldings and remodeling of the arterial wall restore a greater internal cross-sectional area. Incisional pulmonary artery band yields a fixed reduction of 40% of the vessel diameter before application of a circumferential band. (A) A partial Senning technique for improved mixing and saturation and providing both volume and afterload to the left ventricle after pulmonary artery banding. Autologous pericardium is used to baffle the inferior vena cava and the left pulmonary veins across the mitral valve into the left (pulmonary) ventricle, with superior vena cava and right pulmonary vein drainage to the systemic ventricle. The band is best positioned distally to avoid valvular damage in anticipation of the arterial switch procedure. (B) Pulmonary artery banding combined with a modified Blalock-Taussig shunt for rapid preparation of the left ventricle and the arterial switch procedure. This provides left ventricular volume and afterload and can be performed through a left lateral thoracotomy, avoiding the need for a resternotomy at the time of arterial switch. Careful measurement of the proximal pulmonary artery pressure is shown to avoid overtightening the band. PA = pulmonary artery. Reconstruction of the pulmonary artery after band removal may be accomplished by patch arterioplasty using glutaraldehyde-treated autologous pericardium (A) or polytetrafluoroethylene (PTFE) material (B) or resection of the band site and end-to-end anastomosis using absorbable running sutures (C). The authors and editors of Medscape Reference gratefully acknowledge the contributions of previous authors Mark D Plunkett, MD; Hillel Laks, MD; and Khanh Nguyen, MD to the development and writing of this article.